Keep water in your refrigerator – save water AND energy! How many of us go for sugar-loaded sodas or other bottled drinks because we want something cold and the water in our sink is too warm? Think of all the money (from bottled drinks and the gym membership you need to burn off all those calories) that could be saved if we just kept water in the fridge! Did you know refrigerators account for almost one sixth of all the energy used in the average American home? That’s more than any other single appliance! Buying energy star is always important in trying to reduce energy use, but there are a few tricks that can help you conserve even more energy – and one of them, is storing water! Since water is very good at holding its temperature, keeping a pitcher (or more) of water in your fridge will help it to maintain an even temperature when you have less in your fridge, which means it will use less energy and cost you less. Even more important, having cold water ready for drinking means less water wasted waiting for the tap to get cold, and less money spent on plastic bottled drinks, bottled water included! As Brita is fond of reminding us in their ads, “One Brita pitcher can effectively replace as many as 300 standard 16.9-ounce bottles,” which take a surprising amount of energy to produce, ship, and store. 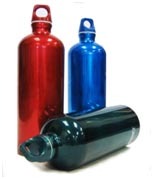 If you want to really cut down on your plastic use, you can find reusable steel water bottles at most convenience stores for a low price and take your water on the go, plastic free! Don’t want to go for a filter? Even without one, much of the chlorine present in tap water from the filtration plants evaporates when water is left to sit uncovered. Even if you are only refrigerating tap water, the results will be purer and more refreshing even than most bottled water. Who knew that something as easy as keeping a pitcher of water in the fridge could save energy, water, and your health! But that’s what sustainability is all about – little solutions for a big world. I always try to have cold water in the refrigerator and a refile bottle of water is always with me. Thank for sharing. Martin, this is great feedback. I have sent your comments to our Energy Manager Tim Vann to weigh in. Stay tuned for details!! I read your comments on the open container with great interest. I am trying to figure out why a fridge set to 40F is freezing contents but only when open containers like a bowl are placed in it. While I agree with the thermodynamic basics of no change in average temperature, I think the practice in the real world is different. I suspect the latent heat of evaporation warms the air inside the fridge and tricks the temperature sensor into thinking the fridge is warm. The fridge then works harder by blowing more air which evaporates more water and raises the temperature further. Opening the door adds yet more thermal energy to the air. Please try a couple of large open containers in the fridge and see what happens. I think the effect will be much more apparent in an already low humidity environment which is my situation. Assuming the fridge door stays closes, I’m going to say no. An open container of water will not cause the fridge to work harder. If the container of water is open, it will allow the water to evaporate into the fridge atmosphere. The water that is left in the container will cool because of the evaporation process. But the water that evaporated into the fridge atmosphere will add latent heat to the air. Because this is a closed system, the latent heat added to the atmosphere will directly match the heat of vaporization lost from the water remaining in the container. The net result is no heat entering or leaving the fridge atmosphere. Also because no mass left the fridge, the fridge interior has exactly the same average density and mass and that mass has exactly the same average temperature so it will not affect the load on the fridge at all. Think of it this way. After all the mass inside the fridge has cooled (and the door remains closed), then the only work the fridge has to do, is to counter the heat being absorbed through the insulation due to the temperature difference between the outside and inside of the fridge. Since the temperatures have not changed then neither will the load. In slightly more scientific terms. The first law of thermodynamics states that the total energy of an isolated system is constant. If the fridge box is the boundary of that isolated system, then the total energy inside the fridge will not change because the container is open or closed. The energy may be distributed slightly differently but the total is the same. Since the energy inside the fridge did not change then the work for the fridge will not change. If you are talking about a real life situation where the fridge is being opened and closed frequently, my answer might change slightly. In this case I think the open container might actually cause the fridge to work ever so slightly less. As I mentioned above the liquid in the container will get colder as water evaporates into the fridge air. The fridge air will get slightly warmer. When you open the fridge you are swapping air inside the fridge with the room air. The room air is normally much warmer than what is in the fridge. The fridge then must cool down the new air that was introduced into the fridge while the door was open. In both cases (open or closed container) the same amount of energy will need to cool down the new air from the room. However liquid remaining in the open container will be slightly cooler than the liquid in the closed container so the open container will give off a little more of its heat to assist in cooling down the new air, so the fridge needs to work slightly less. Even in the second case where the fridge might work less, the difference is going to be so miniscule that you would never be able to detect the difference except with sensitive laboratory equipment. Does keeping and open container of water or some similar fluid require the fridge to work harder? Good information especially in the summer months. Interesting article. But the information you shared and the logic you have shown are absolutely on point. I think people should be more aware of this fact that keeping water in the refrigerator will save both money and energy. thank for your given information or sharing your experience. go ahead man..
there are so many useful thing to learn . thank you. In addition to the facts above, leaving a substantial amount of water in the fridge will take pressure off the motor and prolong the useful lifespan of your appliance. thanx for the suggestion because you are right to drink cold drinks and other drinks are harmful and if any person does gym and drink all these things than these all things not burn any calories or increase and all workout is a waste so keep water on refrigeration and save water and energy. Nice blog..thank you, for all of your hard work you do in getting amazing information to us. I appreciate it so much. Over time, plastic begins to break & leach into water. I found I drink more tap water now that I keep two bottles of water in the fridge door at all times. Great suggestion! Awesome article! I browse your blog regularly and you always post great stuff. By placing and cleaning coils every 6 months your refrigerator will be efficient. There are new door-less type refrigerators that are much more efficient. Most energy is wasted on cooling large empty areas in the refrigerator. Door-less types only cool “pockets” or small areas for individual items. Definitely shop for an Energy Star rated refrigerator, but also keep in mind some of these are more efficient than others. The yellow tag on the fridge at the store will have lots of good energy use info on.